Marvelous Moxie Lip Glosses to complete the looks. Hip Hop 50’s Shop is introducing a new line of vintage dresses including black and white polka dots, flower, pencil skirts and our bold and beautiful red and black dress. When combined with an authentic petticoat underneath you’re sure to look fun and flirty. Chasing Supermom has teamed up with a group of bloggers to help promote this great giveaway. 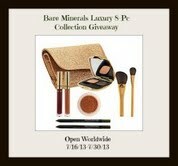 I would love to see one of my incredible readers win this bareMinerals makeup collection! Good luck! The giveaway is available for both US and International entrants. *Chasing Supermom is NOT responsible for selecting a winner or for prize fulfillment.